Burley tobaccos are air cured and harvested by the stalk. The air curing process which takes place in an open barn under natural weather conditions takes 4 to 6 weeks. The leaves will turn from green to light tan or brown. The world's best Burleys are grown in Kentucky and Tennessee. Virginia tobaccos are cured after they are harvested, leaf by leaf in the fields, when the tobacco is ripe. The green leaves turn yellow during the curing time. Virginia tobaccos are grown in many countries around the world. The Carolinas, Georgia and Virginia produce outstanding flue cured tobaccos. Latakia is a renowned condiment tobacco primarily grown and cured from the Greek/Turkish island of Cyprus. The leaves are only 6 to 7 inches long and are of the Turkish Smyrna variety. The leaves are cured over a smoldering fire of shrubs, pine and other fragrant woods. Curing turns the leaves dark brown to black. Latakia is very aromatic and is used from 5% to 25% in English type mixtures. Turkish tobaccos are grown in Greece, Turkey, Bulgaria and Russian Georgia on the Black Sea. These tobaccos are naturally sweet and have good burning qualities. Perique grown in St. James Parish outside New Orleans is used to add spice and flavor to English type mixtures. There are basically two types of tobacco blends-Aromatic Blends that gain their flavor and sweetness because of the various casing sauces and dressings (molasses, brown sugar, vanilla, chocolate, (etc.) and Natural Blends that receive their flavor and smoothness through the skillful blending of natural tobaccos. 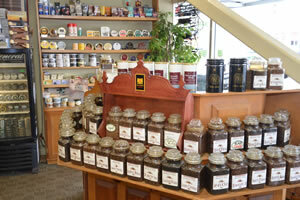 While most American Style Blends are Virginia or Burley based Aromatics, there are a number of straight Burley mixtures and blends of Burleys, Virginias and condiment tobaccos. English Type Blends traditionally are mixtures of straight Virginias or Virginia blended with condiments and/or Orientals. Oriental Blends are "English Type" mixtures with healthy portions of Oriental tobaccos. Scottish Blends tend to be matured (aged) Virginias (possibly with condiments added) and Danish Blends are traditionally sweetened Virginia Cavendishes. Cavendish is a generic term that refers to type of cut and processing. The burning rate of pipe tobacco is determined by the type of tobacco, moisture content and cut of the tobacco, amount of casing or flavoring used, how rapidly the smoker puffs and how the tobacco has been packed into the bowl. Virginias tend to burn more readily than Burleys and condiment tobaccos will slow down the burning rate. Artificially sweet tobaccos will by nature smoke slightly faster than natural tobaccos. Dry or finely cut tobaccos will burn more rapidly and should be packed more firmly. Tobacco blends are often comprised of a mixture of cuts to insure proper burning rates. English flakes are tobaccos pressed into a cake then cut into slices which must be broken up when packing your pipe, and consequently smoke very slow and cool. These mixtures are a good choice for a fast or heavy puffer or when smoking outdoors. A rule of thumb is that your pipe should never become too hot to hold comfortably against your cheek. The key is to experiment, try new brands, tins or mixtures.